The iPhone, photos, and Twitter go together like bacon, lettuce, and tomatoes—they’re a natural fit. Twitter users are constantly sharing little bits of their daily lives, and with the iPhone camera always nearby, many of these updates contain photos. PhotoNest from MindTapp gives you a different way to view your Twitter timeline—by only looking at the photos. Pictures Tell the Story: PhotoNest focuses just on images posted to Twitter. But the app also includes the name and avatar of who posted the image along with any message that they included. 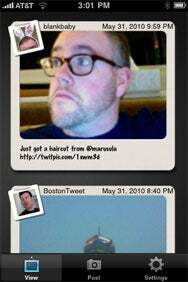 After you launch PhotoNest and sign in with your Twitter credentials, you’re presented with a visual timeline of the photos posted to your Twitter stream. The interface is nicely designed, and simple to use. Each photo is framed within a beige outline that makes it look like an old photo slide. For easy reference, the author’s avatar appears the upper corner, as well as the author’s username and time that tweet was posted. Any message that accompanied the posted photo runs on the bottom of the slide frame. All images are resized so that they fit nicely within the slides on the iPhone’s screen. You simply scroll down to continue viewing more photos. You can also post your own photos from within PhotoNest by selecting an existing image from your camera roll, or taking a new photo from the camera within the app. All photos are posted to Twitter through Twitpic; there is no option to change this if you prefer another service. When you post your photo, you can add your own message alongside it. I found the design of the posting interface lacking. The font was too small and hard to read. The text size mirrored the look and feel of the viewing interface, but when I am entering text, it’s important that I can clearly see what I am typing. Overall, PhotoNest is a fun, different take on viewing a specific part of your Twitter timeline and a little more descriptive than the similar LinkDew. Concentrating only on photos may be too limiting for some, but if the people you follow on Twitter post a lot of photos, you might appreciate a dedicated viewer like the $2 PhotoNest.